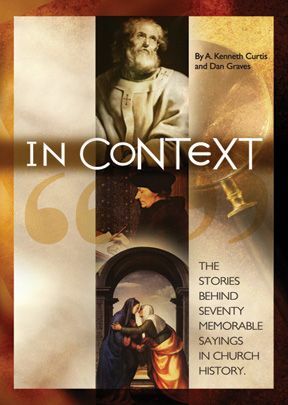 Thirty-five of the stories from In Context appear on this web site. For the rest, look for the forthcoming book. 160 pages, full color, lavishly illustrated. For more information, read the Introduction online, or check out the book in our store. Mary, the Mother of Jesus (flourished first century). Quoted in the Gospel of Luke. The Apostle Peter (died ca. 64). Quoted in the Gospel of Matthew. The Apostle Paul (died ca. 67), in his first letter to the Corinthians. John the Evangelist (flourished first century), in his Gospel. Ignatius of Antioch (died ca. 107), in his letter to the Romans. Unknown author (second century)in the Letter to Diognetus. Polycarp of Smyrna (ca. 69–ca. 155). Quoted in a letter from the church of Smyrna. Justin Martyr (ca. 100–ca. 165), in his First Apology. Vibia Perpetua (ca. 180–ca. 202), in Acts of the Martyrs. Cyprian of Carthage (died 258), from On the Unity of the Church. Constantine (ca. 280–337). Quoted in the Ecclesiastical History of Eusebius. What will you answer to the judge? Sixth Ecumenical Council (681), in its Definition of Faith. Pirmin (flourished eighth century), in the Writings of Abbot Pirminius. The Venerable Bede (ca. 672–735), in Ecclesiastical History of the English People. Theodulf of Orléans (ca. 760–821), in “All Glory, Laud, and Honor. Thomas Aquinas (ca. 1224–1274), in conversation with Brother Reginald. Boniface VIII (ca. 1235–1303), in Unam Sanctam. Julian of Norwich (ca. 1342–ca. 1416), in her Showings.